Julia's Cards: Fringe Scissor Fun!! I have been playing with my new Fringe Scissors!!! 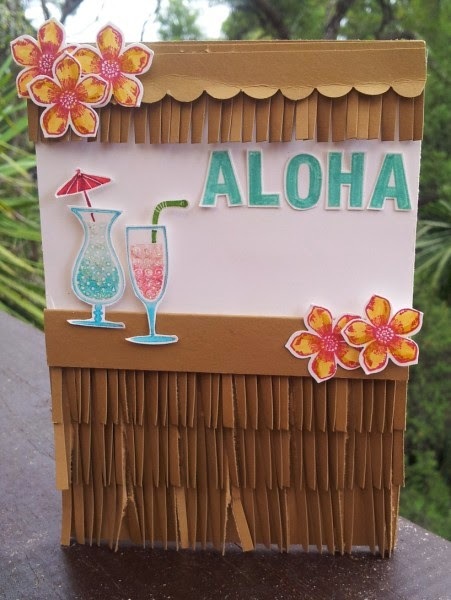 The first card was inspired from our upcoming trip to Hawaii - ALOOOOOOHA! Hubby and I are going in June -25 years after we last went for our honeymoon! The main colour I used is Baked Brown Sugar. The other 3 cards I call my 'pinata' cards - as they remind me of them! 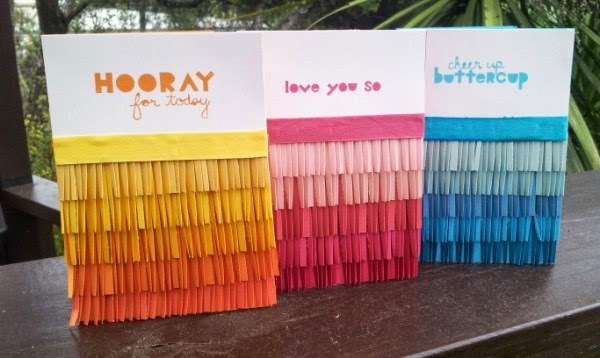 Some people call it ombre cards - either way they are fun! hope you all survived the BIG storm - cough cough! I reckon it was a conspiracy by the bottled water and battery companies!!!! lol better safe than sorry though eh! These are awesome Julia!! Very creative. The fringe scissors are so much fun. What date do you go to Hawaii? I'm going in June too. Not sure on the dates yet though. Honolulu is one of my most favourite destinations. hiya Deb - we're off 7-17th June - first 5 nights in Waikiki and then 4 nights on Maui :) You?? omy, Julia, the tiki bar is so darn cute, what a clever idea!